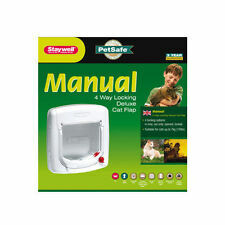 BNIB SureFlap Microchip Cat Flap - White. Condition is brand new in box with all instructions. Dispatched with Royal Mail 2nd Class. 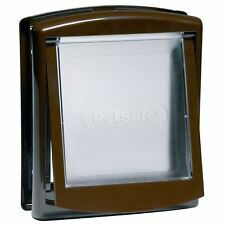 Cat Mate electromagnetic cat flap. Cut out size 168x219mm. Wicklow - Staywell® Original 2-Way Pet Door - Large White. Your large dog can let himself out with the 2-Way Pet Door. Set it to Unlocked for more freedom or Locked when you don't want your pet to use the door. Description Your dog or cat can let himself out with the Staywell® Original 2-Way Pet Door. Set it to 'Unlocked' for more freedom or 'Locked' when you don't want your pet to use the door. Features ---Rigid, transparent plastic flap ---Durable plastic frame ---Fits wooden doors, brick walls, PVC/uPVC and metal doors ---Manual 2-Way lock: open and locked ---Closing panel included System Includes ---Closing panel included Door Sizing Chart Door Size Pet Size Frame Dimensions Flap Opening Cut Out Size Max Shoulder Width Small Up to 7kg 236mm x 198mm 178mm x 152mm 185mm x 158mm 147mm Medium Up to 18kg 352mm x 294mm 267mm x 228mm 281mm x 237mm 219mm Large Up to 45kg 456mm x 386mm 356mm x 305mm 370mm x 314mm 290mm. 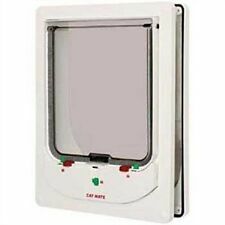 Brand New and boxed SureFlap Microchip Pet Door Connect plus Hub included! Condition is New. features include. Protection against unwanted intruders: the pet door recognises your pet to allow its entry or exit, with up to 32 pets programmable. 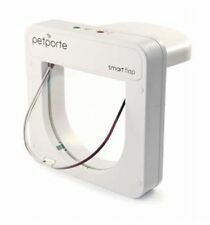 4 out of 5 stars - Brand New and boxed SureFlap Microchip Pet Door Connect plus Hub included! 5 product ratings5 product ratings - Brand New and boxed SureFlap Microchip Pet Door Connect plus Hub included! 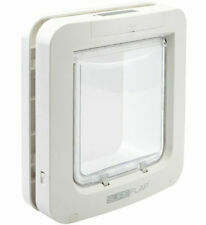 SureFlap Microchip Cat Flap with Mounting Adaptor. Dispatched with Royal Mail Signed For® 2nd Class.